Keeping up with the latest trends, we strive to achieve utmost customer satisfaction. We, as a Manufacturer, Exporter & Supplier, of Pneumatic Perfume Bottle Crimping Machine, deliver immaculate quality to our customers. It is flawlessly manufactured by our experts using top notch raw material and modern technology. The quality we provide is ensured to be in synchronization with industrial standards of quality. Our valued customers can avail this impeccable quality from us at industry leading prices. Pneumatic perfume bottle crimping machine is a single head machine, which is the higher version of Hand operated Perfume Crimping Machine. 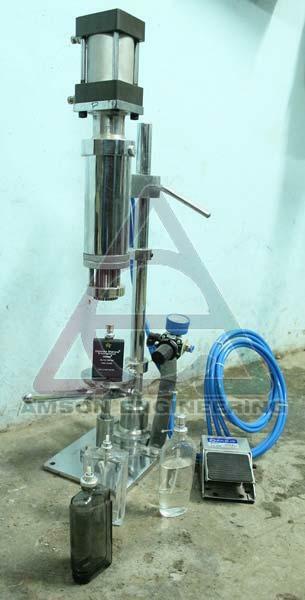 This machine is most suitable for medium and lab purposes. Also, this machine is very much useful, where there is less human labour is available. Here, the operating strength of human hands for crimping is replaced by a pneumatic cylinder. So, ladies can also operate this machine for long time. We have introduced a new design in the market with high efficiency in operation. This model has the facilities such as batch counting, timer operation and auto function also. The crimper has 2 in one action which helps to remove the clamping of bottle while crimping. AEPBCP15 is also made from Mild steel plated for main body and structure. The tool is made with special material which is machined and hardened to get the correct crimping each time. Operating of this machine is also very much simple. A pedal operating foot switch is provided with the machine to do each crimping. When once pressed, a single crimping is done with perfect tight. The foot switch is very soft to operate. Machine is compact and can be moved anywhere by a single person. Each machine is provided with a pneumatic pressure control unit (FRL) with which we can adjust the air pressure required for usage. The machine is compatible with 15mm tool, or 20mm tool as per production requirements. Tool tightness to the neck can be adjusted as per bottle neck variations. Machine is having a bottle resting base with location. When once the bottle is placed and pump is placed over the mouth, the only operation manually done is to press the pneumatic pedal switch. Each pressing and release will do each crimping. Adjustments for heights as per various bottle sizes can be done with the crimping head, by unscrewing, adjusting and tightening the hand lever at the back side on the head. Any sizes of crimping tools from 15mm to 20mm can be supplied from us at extra cost. Maximum net weight for the machine will be 40 kgs. The packing size will be 32” H x 20” w x 21” b. the gross weight including wooden case will be 75 kgs. Crimp cap range - 13mm/15mm/18mm or 20mm at a time as per collet (Tool) size. Output - 25-30 crimped bottles per minute depends upon labour skill. Crimp Tightness adjustable by set screw on the collet. 2 in 1 action enabled to save clamping time. Easy height adjustment and fine tuning with the help of set screw and hand wheel.